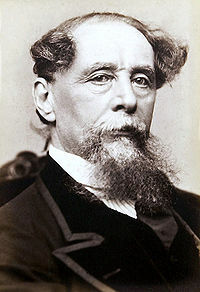 Charles Dickens (February 7, 1812--June 9, 1870; daguerreotype photo at left by Jeremy Gurney, circa 1867-68) saw his timeless Christmas classic published December 19, 1843. Its full, original title is A Christmas Carol, Being a Ghost Story of Christmas. Adapted for radio and dramatized numerous times during the Christmas season in the years before television, perhaps the most well known dramatization comes from the Campbell Playhouse in the 1930s. This reprise of the original 1934 radio play features the patriarch of the Barrymore family of radio and then early film, Lionel Barrymore, also reprising his role of Scrooge. The multi-talented Orson Welles serves as both narrator and producer of the play. This live redramatization of "A Christmas Carol" aired on Christmas Eve, December 24, 1939. While the sound quality is imperfect (a few scratches and pops), it does not detract from this timeless story (replete with eerie sound effects and music), as Lionel Barrymore's emotional portrayal of Scrooge is worthy of a careful listen. Especially moving is the scene where Scrooge finds himself transported to a lonely graveyard where he finds himself staring at his own tombstone, where his unmourned fate leads him to a life-changing epiphany. 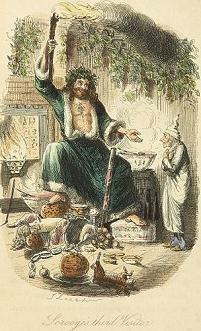 Above right is one of the original illustrations (titled "Scrooge's Third Visitor") from the 1843 1st edition of the book, as drawn by John Leech. For those who celebrate this holiday, Merry Christmas everyone.